First, they illustrate various aspects of user behavior—actions, thoughts, and feelings, among other aspects of their experience. Alignment diagrams also reflect a company’s offerings and business process in some way. Finally, the areas where the two halves meet gives rise to touchpoints between customers and an organization. This last part — the point of interaction — is particularly useful for describing cross channel experiences. 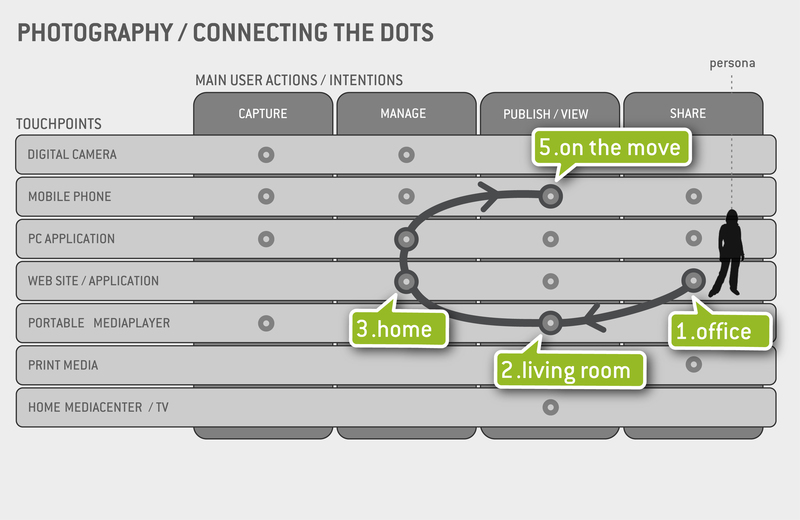 Helping to reveal the structure and the many invisible connections within an interactive system, the proposed model is not only an effective tool to analyze and design the user experience, but also can help us think about the user experience in a different way. Brugnoli’s example follows some of the alignment principles I’ve outline previously, but not all. Absent are more details about the customer experience (thoughts, feelings, etc.) as well as business activities to support the experience. Still, it’s quite a handy tool. In another example, Tyler Tate proposes a similar matrix in his post “Cross-Channel Blueprints: A tool for modern IA“, shown in the next image (Figure 2). 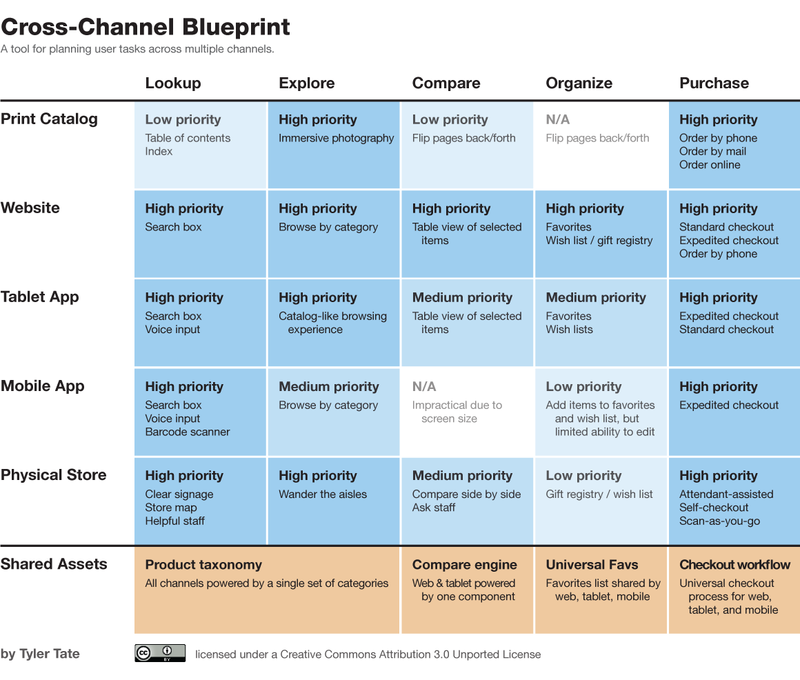 Like the Touchpoint Matrix, above, this blueprint is focused on the channels themselves. Here, however, we see “Shared Assets” — an important addition that points to business-side activities needed to support the experience. So it’s closer to the alignment principles than Brugnoli’s approach. In my experience, both of the above examples can fit into a customer journey map or experience map in their entirety without causing confusing or perceived complexity. That is, stakeholders and team members find it quite intuitive and useful to see a cross channel matrix as part of an alignment diagram. Therefore, I’m advocating the incorporation of channel-based distinctions and information, such as a Touchpoint Matrix, directly in alignment diagrams. By doing this, you get not only channel-specific information, but you can also see how this aligns with both customer goals and business goals. In this light, alignment diagrams are a suitable tool for cross channel mapping and design. Participate in my workshop at the IA Konferenz in Essen Germany, May 10 (1/2 day workshop, in German).